The BBC is aiming to have an equal split of male and female experts on its news programmes, after City research highlighted imbalance across major UK broadcasters. Professor Lis Howell has been monitoring the number of men and women used as contributors on television and radio news shows since 2013, with men consistently outweighing women across the board. Now the BBC has set itself a target of achieving a 50:50 ratio of male to female experts in its news, current affairs and topical programmes by April 2019. As reported by BBC News, Professor Howell’s latest research showed there was an average ratio of three men to every one woman appearing as experts on flagship UK news programmes. Professor Howell will reveal new results from her research at the 2018 Women on Air conference, to be held at City on Thursday 14th June. 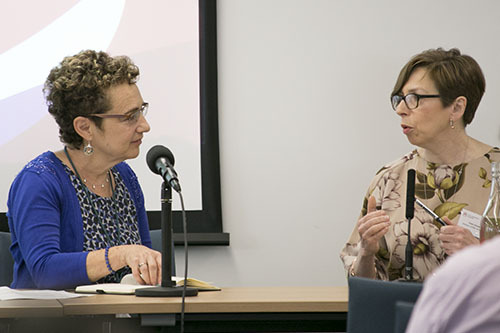 Speaking at the previous Women on Air conference in 2016, Fran Unsworth, now BBC Director of News, praised Professor Howell’s ongoing research. “I want to thank Professor Lis Howell for the incredibly valuable research,” she told the event, which brought together senior editors from the BBC, Channel 4, ITV, Channel 5 and Sky. The BBC said its new initiative would build on the success of a grassroots project which has recently improved the balance of experts on many of the BBC’s news programmes. Outside Source, broadcast on the BBC News Channel and BBC World News, adopted a system of self-monitoring in January 2017 and by April last year had achieved a 50:50 gender split. This has led to other teams at the BBC following suit, with more than 80 programmes from across the BBC – including The One Show and BBC News at Ten – now taking part in the corporation’s 50:50 challenge.